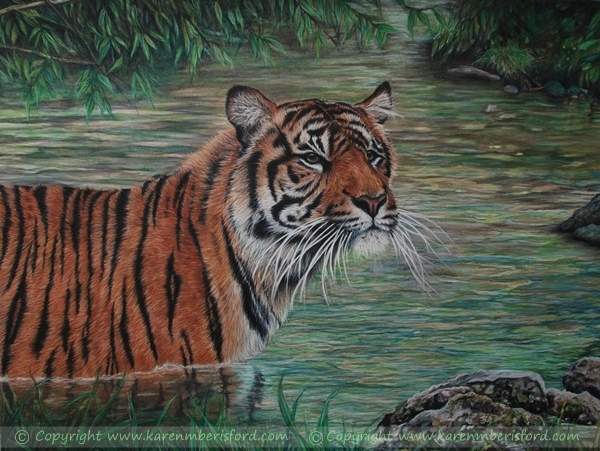 ​This was booked by a lady who had previously asked me to complete a portrait of her West Highland Terrier and who is a big fan of Tigers. Although the original has been sold, there will be prints available of the portrait once completed. More details will follow soon. The Commissionee was more than happy to let me create the final composition once she had chosen the reference image of the Tiger. I knew the best way to place the Tiger would be in water, so using an editing program, I pulled a few sections of other photographs I had in my reference library (from a day out photographing Otters) and roughly placed them on to the one photograph. I know the Artwork will change throughout but the reference is used as a guide - the creation is the fun part! Size: Males - From 87" upto 100"
Threats to their survival: Habitat loss due to agricultural growth, poaching, pray-base depletion and illegal trade primarily for the domestic market.